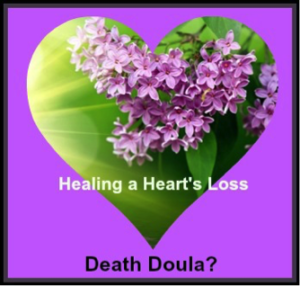 Healing a Hearts Loss » Death Doula? I was talking with a man recently about the loss of his wife to cancer. The conversation then shifted to him sharing how his daughter is a Doula. Since the conversation prior to this was about death, I assumed he was referring to a “death doula”. He looked at me surprised and asked what a “Death Doula” is? Death Doulas, also known as Thanadoulas, (“Than” is Greek for death) End of Life Coaches or Death Midwifes, are individuals who choose to help the dying during their end of life process. This is becoming a newer or reborn way of helping individuals at end of life. Perhaps, family and friends are not available or extra support is needed. What type of person decides to be a Death Doula? An individual who has the ability to be physically, emotionally, mentally and spiritually present to all aspects of dying and grieving. Being able to be present in a number of capacities for those who are dying and their families is not for everyone. I know a few different professions handle death and loss, but being there with the dying individual requires a deeper understanding of death and a desire to help people in a gentle, compassionate manner as death nears. I have spoken with some nurses who for the most part have some of this role and are comfortable with it. I wonder if a Death Doula would also have to have courage and strength of conviction to stay true to themselves even when mainstream society may question how they can do this; how they can sit with people who are dying. What do such individuals really do? Death care and grief support comes to mind. Building a relationship with the dying individual and family with the intent to help everyone journey through loss and death. Listen, acknowledge concerns, be a sounding board, be of service and more. Help to create a personal plan for dying. Be an advocate for those who need it when dealing with professionals. Provide resources and information and when necessary act as a gatekeeper with respect for rest, privacy and access for visits. This is part of Advanced Care Planning, where the dying is primarily at home with supports from family and friends, not in a hospital. I searched for Death Doulas and found the “Death Doula Association of Canada”, but was disappointed to not see much there. I wonder if it is a new organization. I also found the “Home Hospice Association” that has training for “Death Doulas” in Toronto, Ontario and is current. As one article stated, “No one should die alone”; refers to supports being there when needed.